Originally designed as a hybrid of engineering that would bridge the gap between the 5.56x45 and the 7.62x51 but offer its tactical advantage in the mechanism of an AR/clone. 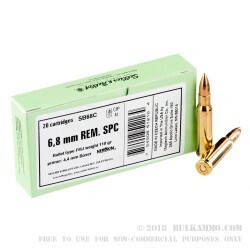 The 6.8 Remington SPC has caught on like wildfire and has gained a good foothold in the market for those who want the hybrid results you cans squeeze out of modern engineered cartridges. Not quite on par with the .308, but lighter and easier to carry, the 6.8 offers pretty good velocity, accuracy; trajectory and carrying capacity comparatively. 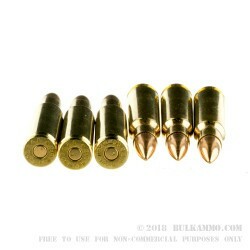 It is a great alternative to the .300 AAC Blackout, when you aren’t going suppressed; and has found a home on the AR/M4/Clone platform because the rounds fit in traditional G.I. Magazines. 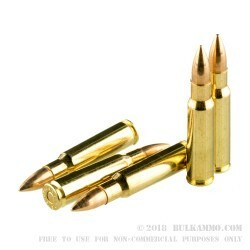 The larger diameter bullet in this load by S&B gives more mass on target with a 110 grain weight and still delivering 2550 feet per second and 1585 ft. lbs of energy at the barrel exit. This equates to heavier hits, bigger wound channels and a flatter trajectory than the much heavier .308 projectiles. You almost get the best of both worlds, when most tactical situations will be between 50 yards and 350 yards for this rifle platform. 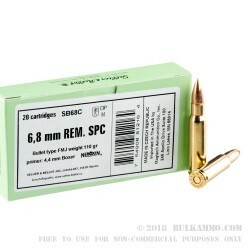 Sellier and Bellot makes a great value round for this cartridge; it’s featured here, and it offers good terminal ballistics; great fun at the range and without gouging on the price. If you like the platform, this is a great bargain for the ammunition; if you’re exploring the platform this is a great place to start.